Anchoring and LED products available for trade sales to boat builders, installers and others. Custom fabrication of ropelight available. Click Here for more info on trade sales. We stock claw and wing anchors up to 110 pounds (Manson Supreme to 100 pounds). Azure Marine now has a local (Southeast Florida) source for larger sizes of stainless steel anchor with emergency / fast turn-around available. 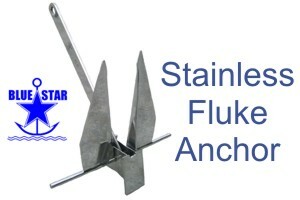 Anchors of many styles and sizes are available from Blue Star, Manson and others up to 20,000 pounds, along with chain by the foot, barrel or shot. Look for another sale here soon! Is your boat in Southeast Florida? We offer delivery and installation services throughout Southeast Florida to both retail and trade customers. Products may be picked up in person by appointment. Contact us with your needs for more information.